McAfee is one of the popular technology brands that provides antivirus and cybersecurity solutions to the consumers and businesses. If you are looking for a complete package that secures all your devices against viruses and malware, McAfee offers protection, detection, and correction services in its products. As a consumer, you expect security systems to offer a simple and effective user interface to protect your data and identity on multiple digital platforms. McAfee’s products are designed keeping this prerequisite in mind and they offer total protection solutions for single and multiple devices. You don’t have to worry about managing preferences and finalizing the setup as the default settings offer what is best suited for your home and business. McAfee products are easy to install and use. The user interface features multiple links and tabs assigned to a specific function and tool. Often as the end user, all you are looking for is an antivirus that is easy to understand and navigate between processes. One of the main features of a McAfee setup is real-time scanning and automatic update function as soon as the software installation is complete. One of the first tasks after installation is authorizing an administrative quick scan to allow the antivirus to look for common computer issues. 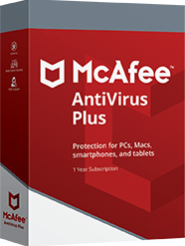 McAfee is one of the oldest brands in the competition that offers a virus protection pledge and a full refund in case you are not satisfied with the products. McAfee manages to deliver good security solutions across platforms with a predefined interface. Hackers and malicious software developers are coming up with new ways of creating viruses and malware. Therefore, it is important to consider an antivirus that offers exceptional malware detection and intrusion blocking. McAfee Total Protection Antivirus offers premium protection with tools including virus, ransomware, spyware, and unwanted programs remover. However, one of the main features of any antivirus is to have a powerful malware detection and that is where the product falls short. While the product may not have extensive malware protection, it manages to block threats with the optimal use of available resources. The price ranges from $50 to $85 approximately, depending on the number of devices. McAfee LiveSafe is a popular product that offers protection tools for an unlimited number of devices. Protection tools include encrypted storage for files, support for multiple devices, and safe web browsing options across Windows and Mac systems. Between Total Protection and LiveSafe, the latter is the recommended choice for ultimate protection. You can purchase LifeSafe for $95 approximately and install the same for an unlimited number of devices. McAfee Mobile Security for Android offers protection against viruses and spyware as well as blocks access to malicious websites. All this is possible while simultaneously boosting phone performance without consuming too much memory or power. Anti-theft and privacy options are some of the additional features offered for Android devices. You can download a free version of McAfee Mobile Security on your phone. However, for added benefits, you may buy the premium version for $25 approximately. McAfee has products that work well with Apple operating systems designed for the iPhone and iPad. The protection tools require a high-speed internet connection to provide features like a secure media vault, locate device, remote alarm, intruder capture cam, and a thorough backup and restore option to protect all data on the device. McAfee for iOS is available to download for free. McAfee Virus Removal Service is a product that features remote virus removal from computing systems infected with a virus. A McAfee Security Expert takes control of your computing system remotely and scans for unwanted applications and malware that might have infected the core system. The remote service manages to clean and secure the computing system. The service can be availed for a price of $85 approximately for one system. McAfee Small Business Security is another attractive option that offers multi-device protection for up to 25 computing systems across Windows and Mac platforms. It also features a comprehensive security package to keep online and offline data secure and provide support for efficient functioning. McAfee Small Business Security is available for a price of $75 approximately. The software is good for running scans that don’t have any impact on the existing processes. It is a decent investment taking into account factors like multiple operating system and platform support, dedicated browser support, and the ability to perform with minimum hardware configuration.